Five notices of intent to sue the town of Kittery, Maine, have been filed following the Kittery Community Center bus crash on Aug. 10. 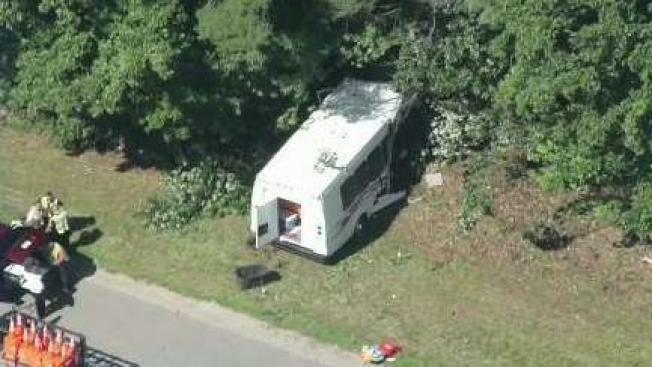 The campers were on the way to a water park when the van ran into a tree off I-95 in Greenland, New Hampshire. New Hampshire State Police said the driver, John Guy, 21, experienced a medical emergency, but have declined to comment further. The number of parties intending to sue the town of Kittery over a bus crash that injured 11 summer campers is growing. The Portsmouth Herald reports that five notices of intent to sue have been filed following the Kittery Community Center bus crash. The campers were on the way to a water park on Aug. 10 when the van ran into a tree off I-95 in Greenland, New Hampshire. New Hampshire State Police said the 21-year-old driver, John Guy, experienced a medical emergency, but have declined to comment further. Town officials acknowledged his driving record wasn't checked. His record included driving convictions, including driving to endanger. Four of the claims were filed on behalf of children, and the fifth was filed by the second camp counselor aboard the bus.